Timely Immigration and Customs Enforcement (ICE) data about the custody history of detainees who were deported or released by the government during November and December of 2012 shows wide variation in their detention times. On a typical work day in this very recent period, the records indicate that ICE detained roughly 1,500 individuals. For four out of every ten of this group — approximately 600 of the total — dispositions occurred very quickly, within three days. And for more than two thirds (70 percent) of the total, ICE custody ended during the first month. Understandably, for those detainees who did not contest their deportations, detention typically ended quickly for the simple reason that these individuals were no longer in the country. On the other hand, longer detention times often occurred in situations where the individual was able to contest the government's attempts to deport them. Indeed, in a perverse way, individuals who were legally entitled to remain in the United States typically experienced the longest detention times. In fact, for some in this smaller group, their lockup might involve a year or more before they won their cases and were released. Among the surprises that emerged from the analysis of the data — obtained by the Transactional Records Access Clearinghouse (TRAC) under the Freedom of Information Act (FOIA) — were the considerable state-by-state variations in the detainee processing times. Half of those picked up in California, for example, spent less than a day in ICE custody and nearly three quarters (71 percent) spent three days or less in lockup. In contrast, only three percent of the individuals picked up in Alabama or South Carolina were detained for three days or less. Of course detention time is a major component of the overall cost of immigration enforcement that is paid for by federal taxpayers. What Are the Odds of Ending ICE Custody Quickly? The shape of the graph shows that a sharply declining proportion of individuals ended their custody as time passed. The highest percentage occurred the very same day — "day 0" — ICE picked them up. This quick pace of decision-making reflects in part that ICE did not need to obtain court approval before deciding many detainees' custody fates. ICE also had a strong incentive to resolve detention cases quickly. The faster the decision, the quicker detention space was freed for the next potential detainee. 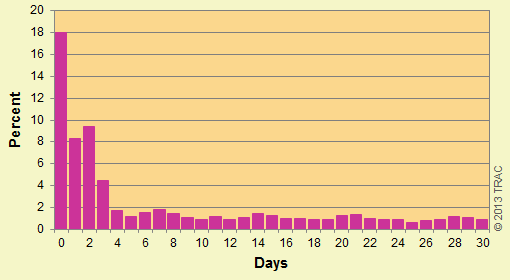 Figure 1 only displays what happened during the first 30 days because otherwise the graph would literally have to stretch to thousands of days before the last person was released from custody. Indeed, of those individuals who left ICE custody during November and December of 2012, one individual was only released after having been detained 2,577 days — that is, over 7 years. Table 1 summarizes the entire distribution, including the number and percentage of individuals remaining in detention as detention time increased beyond 30 days. Sixteen percent were released during the second month, and 6 percent during the third month. Eight percent were detained for 3 months or longer, and 3 percent remained detained after six months (180 days or more). However, because of the large number of ICE detainees, even 3 percent meant that during those two months there were 1,792 individuals who spent six months or longer detained before they ended ICE custody, with some having been locked up for years. Over the course of FY 2013, if these same patterns persist, ICE will have detained over 10,000 individuals for six months or more before they end their ICE custody, and over 30,000 for three months or longer. How long do some individuals remain locked up? According to ICE records, at the end of December 2012 there were 4,793 who had already spent at least six months in ICE custody and still had not been released. For these detainees the average detention time was already over a year. A dozen of these individuals already had spent between 6 and 8 years in ICE custody and still remained locked up. These individuals of course were being administratively detained. ICE does not have authority to detain individuals for criminal violations. The previous TRAC report in this series examined the reasons ICE recorded for ending ICE custody. For example, did ICE custody end because the individual was removed? Released on bond or personal recognizance? Placed in one of ICE's Alternatives to Detention (ATD) programs? Released because the individual was in fact legally entitled to be in the U.S. all along? Not surprisingly, the length of detention varied according to the specific "book-out reason" that ended ICE custody. Table 2 looks at how detention times were distributed by category of release reason. During the first three days, about three out of four individuals ended custody because they were removed or "voluntarily" were returned to their country of origin. During the remainder of the first month, voluntary departures dropped while removals took up the slack so that three quarters continued to be deported. * Release category includes individuals released on bond, orders of recognizance, orders of supervision, paroled, under ATD, prosecutorial discretion, terminated ("won" case). Other category includes escape, death, transfer to U.S. Marshal or ORR, withdrawal. See TRAC glossary for explanation of these and other terms. After the first month, however, the deportation odds started dropping and the proportion of those released increased. By the time individuals had been detained for 6 months or more, only half (53 percent) were removed, while the odds of release rose to 41 percent. Table 3 provides additional detail on detention times by the specific book-out reason (see TRAC glossary for further explanation of each book-out reason). In Table 3 book-out reasons are listed in order of average detention length. The table also includes three additional statistics: median detention days, percent released within the first three days, and percent released after 180 days or more — that is, six months or more. Each statistic tells us something a little different about what is happening, and sorting them on any of these alternative measures results in a different ordering. * See glossary for explanation of these terms. **TRAC's past research has found some inaccuracies in ICE's recording of release reason. We were surprised by the very high proportion (56 percent) of these orders showing up within the first 3 days. It is possible that ICE entries are not accurately distinguishing between orders of supervision and orders of recognizance. Individuals who agree to "voluntarily" return to their country of origin spend the fewest average days in detention — 4 days. Here 90 percent were released within the first three days. None were detained as long as six months. Removals in contrast took longer. Forty percent rather than 90 percent occurred in the first three days, and fifty percent (the median) occurred within 10 days. For removals, the average detention stay was 27 days. At the other extreme, the longest average detention time — 131 days — was spent for those individuals that were not released until ICE or a judge determined that they should never have been detained since they were legally entitled to be in the United States. For some of these individuals (7 percent) ICE found it had made a mistake and released them within the first three days. But fully 20 percent were detained for six months or more — the largest proportion of any category. Thus, those who were entitled to be in the U.S. were the ones who experienced the highest percentage of prolonged detention. For this group detained for at least six months, the average detention stay was 334 days. The remainder of this report presents state-by-state comparisons. The previous report in this series found that states varied a great deal in the proportion of their detainees that ended up removed versus released on bond, personal recognizance, or for other reasons. This report compares states based on how long individuals remained in ICE custody. Similar to earlier reports in this series (here and here), these findings are based on the state in which ICE initially took these individuals into custody. * State where individual first entered ICE custody even when transferred to different state before ICE custody ended; only states which had at least 250 individuals leave ICE custody during November-December 2012 were included in these rankings. As seen above in Table 3, average detention time is generally lower for those removed than for those released. New Mexico with the shortest average detention time also had the highest proportion removed of any state — 88 percent. Because detention time on average is less for those removed, the fact that New Mexico also had the shortest average detention stays therefore is not surprising. However, the state rankings seen in TRAC's previous report and average detention length aren't carbon copies of one another. Massachusetts which had the longest average detention stays (30th out of 30 states) ranked quite high (12th out of 30 states) on the proportion removed. Table 4 also shows that states varied a great deal in the proportion of their detainees who were released quickly. California was the only state that determined the disposition of half of its detainees on the same day that they were placed in custody, and nearly three fourths (71 percent) within the first three days. Alabama and South Carolina at the other extreme only managed to process and determine the disposition of a meager 3 percent of their detainees within the first 3 days. States also showed wide variability in the proportion of those detained six months or longer (180 days or more). See Table 4. Six states shared the lowest level — only 1 percent — locked up six months or more. These were: New Mexico, Arizona, Missouri, Texas, Oklahoma, and Kentucky. Three out of four of the states along the southwest border are among this group. However, the fourth border state, California, had 4 percent detained for six months or more — a rate higher than the national average. At the other extreme, 10 percent or more of detainees picked up in three states spent six months or longer in ICE detention. These three with the highest proportion of long detention stays were New York (11 percent), Maryland (11 percent), and Massachusetts (10 percent). One key unanswered question on detention times is: how does the backlog of cases now pending before the Immigration Courts contribute to delays and therefore longer detention stays for some? The court does give top priority to detained cases on their docket so cases are disposed of more quickly for detainees. However, according to the court data analyzed by TRAC covering the current fiscal year, at some facilities the average time to resolve a case can be a year or more when a judge decides the detainee is entitled to remain in this country. And if either the government or the detainee appeals the judge's decision, the ultimate time to resolve a case can stretch much longer. Unfortunately ICE withheld the specific information needed to determine which cases were before the courts, which had been already decided by the courts, and which cases ICE had the authority to decide on its own. This is the legal process involving the removal of a person from the U.S. who is not a U.S. citizen. Under the Illegal Immigration Reform and Immigrant Responsibility Act of 1996, the formal term for deportation was changed to "removal." With removal, the individual is also legally barred from reentry to the U.S. for a period of years. The length of this bar varies depending upon the specific removal provision invoked. So-called aggravated felons are permanently barred from ever reentering the U.S. Voluntary returns and voluntary departures are quite different from removals; while these individuals are required to leave the U.S. they are not legally barred from reentry to the U.S.
TRAC requested data on any court proceedings involving these detainees but ICE has not released this information so we are not able to identify those who were awaiting decision by a judge on their case. In addition, there was one individual who ICE recorded as still detained after 6,332 days (17.3 years). Part of that time was spent in U.S. Bureau of Prisons (BOP) facilities although ICE records treated this as continuous time in ICE custody with 9 transfers among facilities. While ICE does at times use BOP facilities for administrative detention, the overall length of detention for this individual combined with time spent in BOP facilities raised doubts in our minds on the reliability of ICE's classification of this case. These removal percentages were based on the number of continuous custody stays rather than individuals. If an individual was released and then taken back into custody prior to removal that individual was counted both as a release and as a removal. Unfortunately, ICE refused to provide information identifying custody periods involving the same individual although the agency had provided this information to TRAC in the past. CBP, in contrast to ICE, releases this information on Border Patrol apprehensions and removals so those related to the same individual can be linked. These include individuals released on bond, orders of recognizance and supervision, those paroled, placed under one of ICE's ATD (alternatives to detention) programs, released under prosecutorial discretion, or had their proceedings terminated. Presumably in most situations the initial pick-up location would be close to where the individual was apprehended. Detention time captures the total time the individual remained in ICE custody, including time spent at other ICE facilities following any transfers of the detainee.